London 1654: Kit Lovell is one of the King’s men, a disillusioned Royalist who passes his time cheating at cards, living off his wealthy and attractive mistress and plotting the death of Oliver Cromwell. Penniless and friendless, Thamsine Granville has lost everything. Terrified, in pain and alone, she hurls a piece of brick at the coach of Oliver Cromwell and earns herself an immediate death sentence. Only the quick thinking of a stranger saves her. Far from the bored, benevolent rescuer that he seems, Kit plunges Thamsine into his world of espionage and betrayal – a world that has no room for falling in love. Torn between Thamsine and loyalty to his master and King, Kit’s carefully constructed web of lies begins to unravel. He must make one last desperate gamble – the cost of which might be his life. Kit Lovell is the kind of rogue you'd like to have at your back, even though he's also the devilish kind of guy who may or may not cheat you out of your gold in the gamer's den. He's got a major chip on his shoulder about one Oliver Cromwell, and when a be-trodden beauty ends up endangering Cromwell's life, she sort of endears herself to Kit. Thamsine, through a series of very unfortunate events, finds herself in the dangerous predicament of having nearly done bodily harm to Oliver Cromwell and therefore potentially on the receiving end of a very deadly death sentence. These two were very interesting characters. They both have lots, and I mean LOTS, of flaws but that did keep them interesting. A few times I felt like throwing my hands up in the air because they were frustrating me so much. In the end though, these flaws were really growing pains. Through all of the adventures the two have, and the mystery and deceit flying around through Kit's life...there's a bond there that is spicy and sweet. 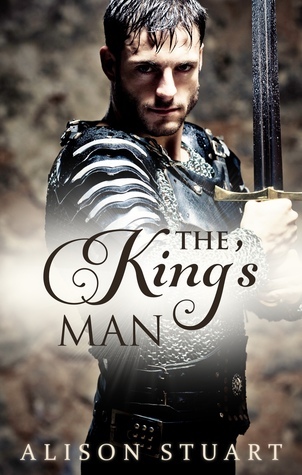 The King's Man is the kind of Historical Romance that sets the genre on fire and makes you realize why you love to get lost in the past of romances of the likes of Camelot. I just ate this book up and really wanted more. I'm about to go back and get By The Sword (the first book in the series) just so that I can recap and get the full picture. Alison Stuart is one to watch if you're a fan of romance, historical or otherwise. Thamsine Granville had not begun the day with the intention of killing Oliver Cromwell. Around her a jovial crowd pressed against the barricades, determined to enjoy the spectacle of the Lord Protector’s ride in state to dine with the Lord Mayor of London. But from across the road, he had seen her. A triumphant smile crossed his handsome face and he raised his hand to his hat, doffing it as he bowed. She saw him mouth her name and push his way towards the barricade. Thamsine swallowed, her mouth dry with fear. She only had a few moments to make good her escape, but the press of people to her rear hemmed her in, pushing her toward the barriers. The bells of London, silenced for so many years, rang out, and above her the flags of the City Guilds flapped in the chill wind. A roar went up from the crowd as the coach bearing Cromwell approached. From where she stood she could see the Lord Protector, clad in a reddish-coloured suit embroidered with gold. He inclined his head to acknowledge the cheers of the crowd with all the aplomb of a man born to such a station. She could see no trace of the simple farmer he had once professed to be. Thamsine’s heart beat a rapid tattoo. Oliver Cromwell, Lord Protector, the false King, was about to become Thamsine Granville’s personal protector. She stooped and gathered up the broken piece of brick at her feet. Award winning Australian author, Alison Stuart learned her passion from history from her father. She has been writing stories since her teenage years but it was not until 2007 that her first full length novel was published. Alison has now published 6 full length historical romances and a collection of her short stories. Her disposition for writing about soldier heroes may come from her varied career as a lawyer in the military and fire services. These days when she is not writing she is travelling and routinely drags her long suffering husband around battlefields and castles. Alison will be awarding a Kindle to a randomly drawn winner via rafflecopter during the tour. Thank you. I do hope you enjoy it. New releases are so excited! I bet it feels great to release this book after working hard on it! Congratulations on the release of The King's Man. Hostorical Romance is my favorite genre and this one sounds great ! Yay, Deanne. I am so tired of hearing 'historical romance is dead'! I'm a reader too and historical romance is always my 'go to' books. Sounds like a great book, thanks for sharing it and your thoughts! It is so hard to choose excerpts that you hope will catch a reader's attention. Glad you like it! I love historical fictions set in medieval times. Looks like this one is right up my alley. Thanks, Chase. It is actually set a little later than true medieval (publisher chose the cover!) but I hope you will enjoy it anyway.
" ... when she is not writing she is travelling and routinely drags her long suffering husband around battlefields and castles." I love it! It's a tough life... but someone has to do it! Fortunately my husband has a military background too so we end up replaying the battles. Congrats on the new release! And thank you for the great giveaway. Thanks, Talex. I should just clarify - I'm not giving away a Kindle Fire... just a 6" Kindle ereader. Even though I read books on Kindle apps on my tablet I actually really like reading on the Kindle. Thank you for hosting me, Andra and for your kind words about the story. So glad you liked it. I should just clarify the rafflecopter prize is not a Kindle Fire - just a 6" Kindle Ereader. Good luck to everyone who entered! Thanks for the spotlight and excerpt! OMG, luv the excerpt. Divine. . Wow, prize kindle is fab. & splendid. 2 fingers snap. It is tight, fly & off the chain. Thank you for the awesomeness, the contest, and generosity. :) Pick me, pick me! Glad you like it... and while I wish I could give a kindle to everyone, I assure you the winner will be completely random! I love historical fiction...thanks for the new release! Thanks Elaine... this is very much historical fiction with romance ie lots of history. Hope you enjoy it. I would love this e reader.